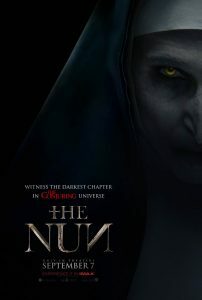 The Nun is the latest instalment in an ever-growing series of loosely connected horror films started by the surprise success of director James Wan’s The Conjuring (2013). Here the story is credited to Wan, but he did not direct. The Nun’s director is Corin Hardy who struggles to duplicate the controlled rollercoaster effect of the previous Conjuring films. While The Nun hit number one in its opening weekend it is unlikely to have the staying power of the earlier franchise films and for good reasons. Set in 1952 Romania in a remote dilapidated castle converted into a cloistered Abbey, the plot revolves around a Roman Catholic priest, Fr. Burke (Demián Bichir), and a young novice nun, Sister Irene (Taissa Farmiga), who are sent by the Vatican to investigate the apparent suicide of Sister Victoria (Charlotte Hope). Aided by Frenchie (Jonas Bloquet), a French-Canadian world traveller who had settled into the Romanian countryside to provide help to the people, the trio set about discovering what mysteries hide in the spooky Abbey castle. What follows is a paint-by-number story of things that go bump in the night unfolding predictably as characters are drawn deeper into the reason for Sister Victoria’s death which turns out was a personal sacrifice and not a suicide. The last living soul in the convent she killed herself to prevent a demon, Valak (Bonnie Aarons) masquerading as a nun, from gaining a physical body to possess. In a not so surprising twist all the sisters with whom the trio interact turn out to have been ghosts or maybe apparitions controlled by the demon—it’s not made clear which is the case. Once the three realize they must stop the evil from leaving the castle the fight is on to contain it and the trio risk their lives attempting to send Valak back to hell and prevent it from escaping into the world. [Spoiler alert] It does escape because the demonic nun appears in Conjuring films set chronologically after this film. Valak, the ghostly demonic figure haunting the Abbey, looks like a cross between F.W. Murnau’s 1922 Nosferatu vampire and the theatrical shock-rock-metal 1990s Alice Cooper wannabe front man and singer Marilyn Manson all wrapped up in a nun’s habit. If viewers find this aspect scary, then the film is more likely to be scary. Wan introduced the Valak character in The Conjuring 2 (2016) where, as director, he made the nun’s sequences some of the most memorable moments. With that debut the evil nun was teased as a potential stand-alone film project as Wan had done with the ‘cursed’ doll Annabelle in the original The Conjuring (2013): the doll’s memorable cameo led to Annabelle (2014) and its sequel Annabelle: Creation (2017) which also teased Valak the nun. The pump was primed for this current Conjuring prequel and with promises of real scares. Sadly, The Nun doesn’t deliver on the promises. The film suffers from several problems from over-use of jump scares to an under-developed narrative and script. The film suffers from several problems from over-use of jump scares to an under-developed narrative and script. In addition, horror films work best if they follow the viewer home creeping into the dark corner of the viewer’s bedroom closet so when the lights go out and they’re crawling under the covers there’s a lingering sense of dread. For this to work successfully there needs to be a relatable hook in the story, something that makes viewers think twice long after the film is over. After Alfred Hitchcock’s Psycho (1960) some viewers were afraid to take a shower in the house alone. Likewise Spielberg’s Jaws (1975) prompted second thoughts about going to the beach and swimming in potentially shark-infested waters. The Nun lacks this kind of hook because, for most of the audience, there is nothing familiar about a medieval castle Abbey. It’s as if the vampire in Bram Stoker’s gothic novel Dracula (1897) never left the castle in Transylvania. The Nun seems trapped in the first four chapters of Stoker’s book never encountering the world with which the reader, or in this case the viewer, is familiar and where a demonic nun could appear standing in a suburban backyard at night. Where Francis Ford Coppola’s adaptation Bram Stoker’s Dracula (1992) imbued Dracula’s castle with a certain operatic flair with colourful moments of gothic horror, The Nun director, Hardy, largely fails in achieving anything remotely similar in effect. This leaves The Nun a dim and drab looking movie with a brown and blue colour scheme that becomes a kind of visual white noise; the shadows are not full of fear as much as they are pregnant with predictability. This all adds up to a forgettable film never really getting under the skin of viewers. And for most people who enjoy these sorts of films that’s what they want: a movie that will get under their skin, give them the willies and linger in their mind. Lutherans and Protestants don’t generally recognize relics as authentic or, even if authentic, recognize them as being efficacious in the way the Roman Catholics claim. Christian viewers with a working knowledge of Roman Catholicism will also be left scratching their heads because the big nail in the coffin for Valak comes in the form of a relic containing blood collected from Christ Jesus at His crucifixion. This purportedly real blood is used to send the demon nun back to hell and seal the rift from which she had originally escaped. In a movie where a central character is a Roman Catholic priest who presumably believes in transubstantiation (the belief that the bread and wine of the Lord’s Supper become 100 percent the Body and Blood of Christ and that there is no bread or wine present following the words of institution) there would be no need for a special relic with Jesus’ blood collected from the crucifixion. A Roman Catholic priest could simply say mass and have the same thing available to him. Actually, the Roman Catholic Church maintains a purported relic containing the Blood of Jesus believed to have been collected by Joseph of Arimathea at the crucifixion and brought from the Holy Land by Thierry of Alsace, Count of Flanders, to a Roman Catholic basilica in Bruges, Belgium. Is there a difference between the two in Roman Catholic thinking? Does any of it matter in relation to this film? Lutherans and Protestants don’t generally recognize relics as authentic or, even if authentic, recognize them as being efficacious in the way the Roman Catholics claim. In the film this uber-powerful relic is presented as a blend of the glass slipper of Sleeping Beauty (1959) and the Holy Hand Grenade of Monty Python and the Holy Grail (1975). As a result, along with any other religious paraphernalia or otherwise blessed or holy objects depicted, it comes across as either schmaltzy kitsch or a run-of-the-mill unimportant artifact treated in a blasé fashion. While the blood of Christ is not spoken of symbolically in The Nun the film also fails to convey any real presence of Christ. Such things are reduced to props, as are the religious clothing worn by the priests, nuns, and bishops. Likewise talk of perpetual adoration, prayer, and vows within the film are nothing more than a veneer. The successful use of Christian imagery and symbolism in the horror genre generally and in this film, relies on breaking religious taboos and the corruption of pure things using blasphemous images or the degradation of what is believed to be good to illicit fear, terror, or at least unease. But there are only so many upside-down-bursting-into-flames-crucifixes an audience can see before they lose all effect. This approach relies on viewers having some religious piety of their own where they hold these Christian symbols and religious items in high regard. With the continuing shift in demographics and the rise of the “nones”—people who check the box for “none” on surveys of religious affiliation­—one has to wonder how much longer films like this will be economically viable. For instance, a headless Christ on a crucifix is only disturbing if the audience has any reverence for a crucifix and what it represents. If viewers have no faith in Jesus and Him crucified it will fall flat. William Friedkin’s The Exorcist (1973) succeeded in gripping the public’s imagination in the early ’70s because it transgressed the boundaries of religious and cultural taboos still widely held in North America. Faithful Christians know that Scripture teaches that demons are real. The Gospel accounts report Jesus dealing with them personally, and people interact with them today regardless of what skeptical minds think about the supernatural. The Nun, while working to scare, decides rather to make its demons into cartoonish props for jump scares. This perhaps is why The Nun almost defies criticism; it never takes its subject seriously. If anything, Friedkin’s The Exorcist was a serious film. Because this film doesn’t deal with Christianity honestly or treat the occult, the supernatural, or demons thoughtfully, it’s hard for audiences to buy in and suspend disbelief long enough to do the same. It also makes serious critique of the core subject matter sound equally silly. The Nun occasionally flirts with the kind of goofy campiness found in Roman Polanski’s The Fearless Vampire Killers (1967) or Stephen Sommers’ The Mummy (1999) or Sam Raimi’s Army of Darkness (1992) but never fully commits to it. Clearly, The Nun doesn’t know what it wants to be. For a film advertised as “the darkest chapter in The Conjuring universe” The Nun can hardly commit itself to be a full-out campy schlock-fest. Taissa Farmiga, the younger sister of Vera Farmiga who plays the paranormal investigator Lorraine Warren in the Conjuring films, does a fine job in her role as Sister Irene the film’s novice nun, but a single performance can hardly save a film. The Nun’s lukewarm delivery is neither likely to leave a lasting impression on film goers nor keep anyone awake at night. However, with an estimated production budget of $22 million and box office returns in its first two weeks of more than $86 million The Nun has managed to scare up enough of a return on the investments of its backers to secure future installments in the years to come. The scariest part of The Nun might be the announcement of a sequel.